Details about Bose Remote Control Wave Radio AWR1-1W AWR1-2W AWR113 AWR131 AWR1W1 AWR1G1 NEW! Bose Remote Control Wave Radio AWR1-1W AWR1-2W AWR113 AWR131 AWR1W1 AWR1G1 NEW! As decsribed. Came earlier than expected. Thanks! Product received was exactly as described. Fast shipping & great communication. I have an older Bose radio and this remote is a factory fresh replacement for the remote, for AWR1G1, which is the Bose without a CD player, just a radio. The one I received has in factory-fresh wrapping, the battery is good, and there was no programming necessary; it is a plug&play remote. I found other remotes on eBay and Amazon, some Bose and others generic, that the sellers promised would work just fine and they all were cheaper BUT getting the correct one from a trusted seller who shipped immediately is well worth the few dollars I may have saved had I chosen to take that route. I couldn't set the time on it, couldn't make station presets on it, (of course it could be just me), the mute button seems to do the same thing as the power button just below it and the unit is really too small for the large handed. But it sure does do a mean remote volume control, EXCEPT for the fact that it jumps 2 increments at a time. So much for subtle changes. All in all, most surprising and disappointing for a Bose product. 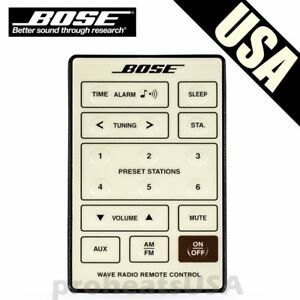 I had questions prior to purchase, vendor answered quickly, and I just tested the remote for my older model Bose radio. It was easy to set up and it works very well. If something were needed in the future and this vendor had it, I would definitely use them again. Thank you so very much. Service such as this doesn't come around as much nowadays. Dog ate the old one. This was brand new, perfect condition. Saved my life! Worked very well from the moment the battery was installed. It doesn't glow in the dark so the bump on each button is a big help in the dark once you train your thumb. Also discovered this remote operates my older charcoal Wave Radio as well.